To Cook, changing the world always has been higher on Apple’s agenda than making money. He plans to give away all his wealth, after providing for the college education of his 10-year-old nephew. There should be plenty left over to fund philanthropic projects. Cook’s net worth, based on his holdings of Apple stock, is currently about $120 million. He also holds restricted stock worth $665 million if it were to be fully vested. 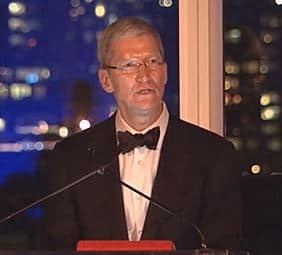 Cook says that he has already begun donating money quietly, but that he plans to take time to develop a systematic approach to philanthropy rather than simply writing checks. Cook remains the only openly LGBT CEO in the Fortune 500. Read the full Fortune piece here.